With this new 8-Color Gamma XD Printer Series Durst has re-invented ceramic tile decoration featuring new possibilities for unique and creative tile design and ultimate production efficiency. Gamma XD combines the highest quality inkjet technology with a unique print engine to break the barriers to quality and speed, maintaining the required ink amount per sqm. Durst holds various patents on this new, innovative technology. 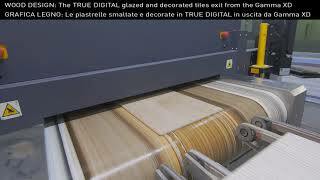 Create new stunning tile designs with this new optional DM print head technology with its unique capability of jetting large amounts of digital ceramic materials, glue inks, etc. and effects such as luster, glossy, matt, white, metallic. Thanks to the high laydown capacity with over 100g/m2 per color bar, the Durst DM technology provides very strong ceramic effects offering more creativity in developing new, unique tile designs. No other technology can jet such high ink amounts consistently without losing nozzles. Optional dual line operation through two completely independent printing queues. This allows printing completely different jobs/images on different tile sizes (width and length) on each line, which means 2 printers in one. The new Gamma XD Dual Line Technology offers total flexibility in dividing the full printing width for the lines in any position. Special tile guiding system with two individually adjustable tile guides for instant and repeatable changeover from single to double line and vice versa. Job preparation, job management and corrections can either be carried out directly on the printer or via remote control through the Gamma PrepStation, typically installed in the lab with to have the operator just selecting the job and start the printing process. 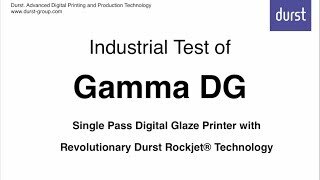 Gamma XD printers with left and right hand operation print exactly the same. Installation with or without Enclosure - The Durst Gamma XD Series can be installed and operated with our without an enclosure (cabin) with controlled ambient conditions. Thickness scanner and fast movement of the print engine to automatically maintain a constant and closest possible tile to print head distance for best image quality, details and sharpness independently from the tile thickness and shape. Reliable performance at any speed up to 76m/min. Rapid ongoing re-printing of ceramic tiles with minimum stock is becoming more and more important among many tile companies. In order to achieve this a very precise and adequate Color Management system tailored for ceramics is required.Most Color Management systems do not provide fast color matching with just 1 or 2 tests when reprinting an existing tile design after approx. 1 month or in another production location resulting in a long downtime of the effected glazing line and production loss. The new Durst-ColorGATE CMS is the first color management solution designed and optimized specifically for the requirements and conditions in ceramics(small and non - linear color space of ceramic inks, flat and structured surfaces, inconsistent process conditions). Unique, patented “Rapid Spectro Cube” measuring device for ultrafast reading of test charts printed on flat or structured tile surfaces. 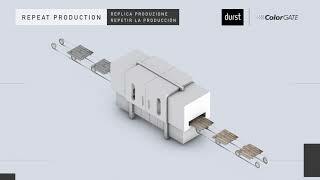 Practical field experience at different tile companies confirm that the new ColorGATE CMS Durst Edition specifically designed for ceramics is really the first true color Management Solution which drastically reduces the number of test prints when repeating the production of existing products over time. Thanks to its unique, precise and fast color matching system ColorGATE CMS Durst Edition eliminates long glazing line downtimes and allows fast production changes and smaller production runs/batches. As one can see the results of both the first test run were basically spot-on considering that it was printed with a different ink set (most challenging work), respectively different glaze coloration and the customer was very surprised and most satisfied with such results never experienced before. ColorGATE and Durst Phototechnik AG have recently announced their exclusive distribution partnership. The first jointly achieved results of the cooperation, which has now lasted for almost two years, can be found in version 10.30 recently released by ColorGATE.Numerous functions and work processes have been optimized and specifically developed for the needs and conditions in ceramic tile production.Thus, the CPS meets the specific requirements in tile decoration even better and allows an easy and efficient use of the professional color management tools. "In the view of streamlining the industrialization process, we decided to rely on a consolidated partner such as Durst, and in particular to test and use the Durst-ColorGATE CMS system. Over time, thanks to the support of Durst engineers, we have achieved important results in terms of efficiency and effectiveness of the industrialization process by significantly reducing the number of test runs." "We have been very impressed with the first results of our new Durst-ColorGATE CMS color management system and did not expect such a fast and precise color matching even printing the same design with different inks and glaze colors. Almost spot-on with the first test never experienced before. This will certainly increase our production efficiency."